PUT SAFETY FIRST! VOTE NO ON SB 1189! Over 200,000 Americans have been killed by prescription opioid overdoses since OxyContin was unleashed on the market. Texas has four cities that rank among the top 25 in the country for opioid abuse. Big Pharma funds 3/4 of the FDA's "scientific review" budget. It's no surprise, then, that nearly 1/3 of the drugs approved by the FDA have safety concerns. Meanwhile, Pharma floods consumers with $6 billion in ads, including 663,000 TV commercials. Despite this, some lawmakers are pushing SB 1189, which makes it harder for you to receive warnings about dangerous drugs. You have a right to know if a prescription drug is hurting or killing people. Drug companies would love nothing more than to escape accountability for their wrongdoing. If you're kept in the dark, you can't hold them accountable. And you can't protect your loved ones. Please contact your lawmaker and tell them to "VOTE NO ON SB 1189." Tell them that you have a right to know about dangerous drugs and that they should put safety first. 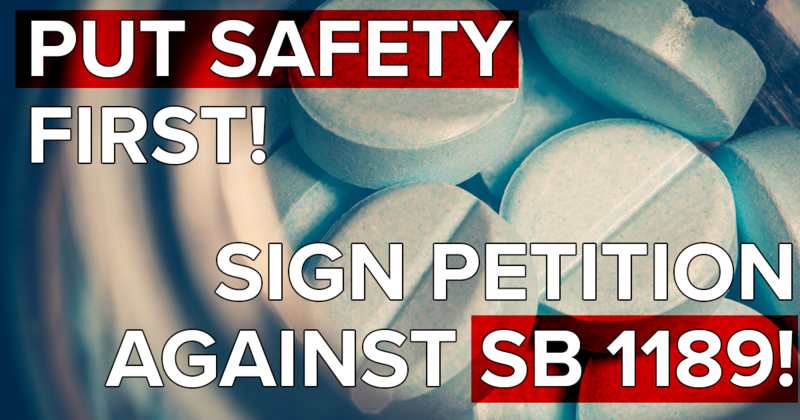 SIGN NOW below and learn more about our fight against Big Pharma here.